A pop-art style piece depicting a single frame from a non-existent comic-book. When you take a frame from a comic-book and show it on its own, it can totally change the context of the characters and situations they depict. A frame from one which doesn't exist doesn't even allow you reference to the original and almost asks you to think of possible scenarios for it. On it's own, it takes on a more symbolic from. Whether it's the acquisition of great power, wealth or knowledge by those too inexperienced to handle it, or an image that's a metaphor for the onset of adolescence, it can have different meanings whichever way you look at it. 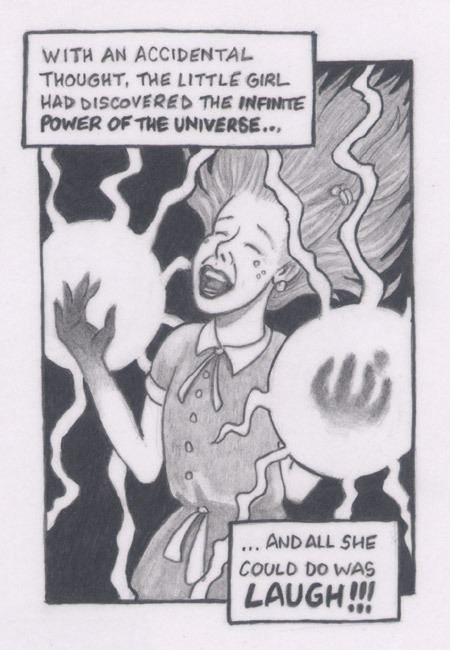 Or it could simply be a fantasy image of a little girl that's suddenly discovered amazing magical powers.